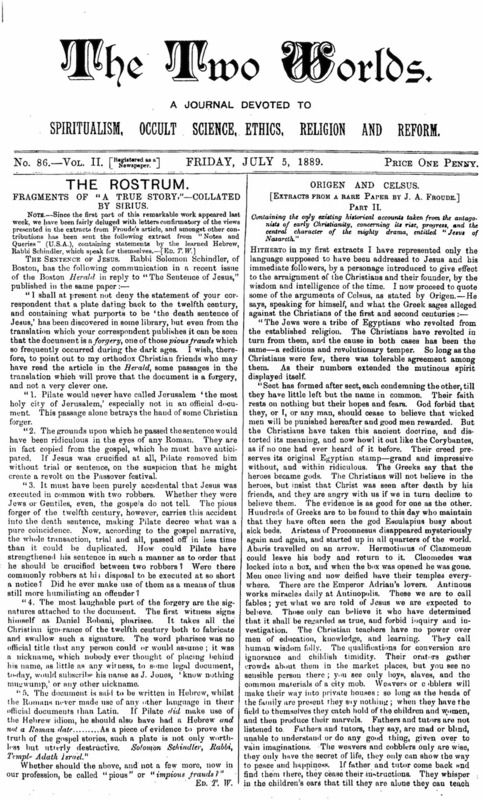 A Journal Devoted to Spiritualism, Occult Science, Ethics, Religion and Reform / Devoted to the Progress of Spiritualism, Occult Science, Ethics, Social, Political, and Religious Reform / A Journal Devoted to the Facts and Philosophy of Spiritualism, Religion and Reform / A Weekly Journal Devoted to the Phenomena, Philosophy, and Progress of Spiritualism—Also to Religion in General and Reform / The People’s Popular Spiritualist Paper, Devoted to Spiritual Science and Religious Progress and the Facts and Philosophy of Spiritualism. London and Manchester, England. Publisher: John Heywood (London), Two Worlds Publishing Co. Limited (Manchester). Editor: Emma Hardinge Britten with E.W. Wallis as sub-editor (from 1887 through February 1892); E.W. Wallis, Will Phillips, and (from 1906) J.J. Morse; Ernest W. Oaten; Maurice Barbanell. 1/1, November 18, 1887-current. 16 pp., 8/1/2 x 14. One penny a week. This was begun by Emma Hardinge Britten who edited it until she left in a huff early in 1892 to begin The Unseen Universea>. The early issues bear her stamp and tend toward the occult, with excerpts from her Ghost Land and articles by "Sirius" that were heavily larded with quotations from her Art Magic. The early years of the journal also regularly featured two full pages of "Services for Sunday," announcements for spiritualist services in Britain, and three full pages of "Chronicles of Society Work," on the happenings in local spiritualist societies. The journal was less intellectual and more vigorous and provincial than its London competitors. It was "the people’s popular penny spiritual paper," as its motto and advertisements read. When James Burns’ Medium and Daybreak ceased in 1895, The Two Worlds became the leading exponent of progressive, reform, non-Christian spiritualism in Britain. It continues to exist. NYPL (incomplete, 1888-1919); LOC; Boston Public Library; University of Kansas; Duke University; University of Texas, Austin; and other locations in OCLC; ZDB: Freiburg Inst Grenzgeb Psychol. This run of the Two Worlds, from 1887 to 1892, during the editorship of Emma Hardinge Britten, is also available from The E. H. Britten Archive. The download links are located on the Bibliography, under Periodicals. Issues are retained at IAPSOP for indexing purposes.